This Arrow 100CR-UC is small format 6 pin (Best type, SFIC) interchangeable core. 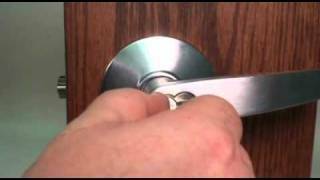 It is not necessary to remove the lock from a door to rekey the opening. A special control key is used to remove the old core and install the new core. Cores are uncombinated, ready to be keyed. (no pins, springs or keys). Uncombinated 6 pin small format (Best type) interchangeable core. When using this uncombinated, 6 pin, small format interchangeable core, it will not be necessary to remove the lock from the door to rekey the opening. A special control key can be used to easily remove the old core and replace it with a new one.